What's next for Greece after a 'no' vote? 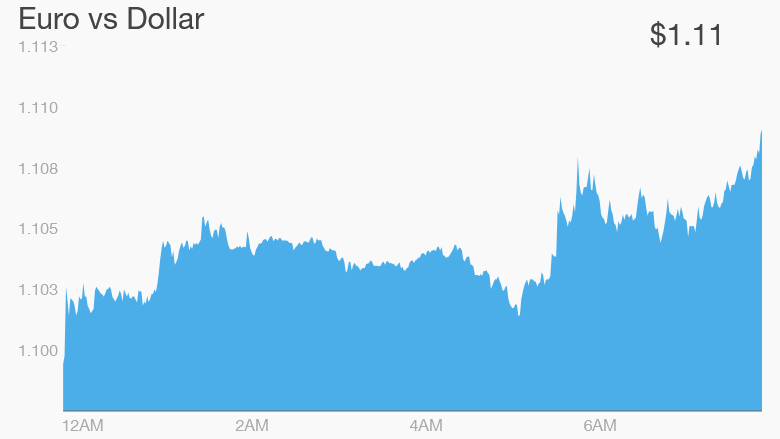 Markets are sliding following Greece's historic "no" vote, but uncertainty about what happens next is keeping losses in check. Global stocks sank after Greek voters said "no" to Europe's latest bailout offer by a big margin in a referendum on Sunday, backing their left-wing prime minister's call to reject austerity. The result takes Greece a step closer to leaving the euro, analysts say. 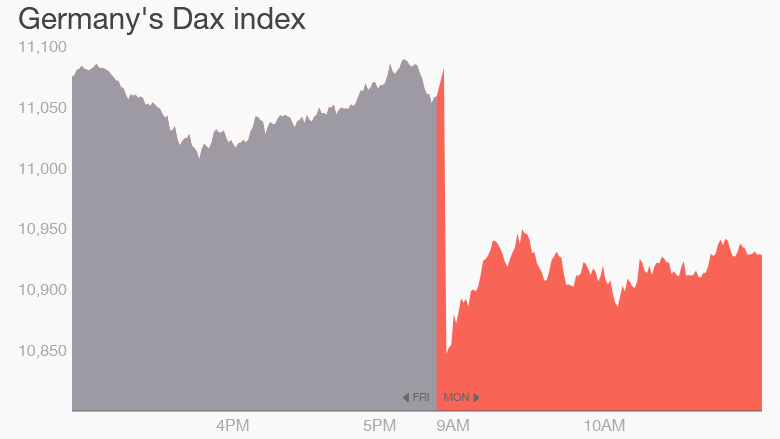 In Europe, Germany's DAX lost 1.4% and France's CAC index tumbled 1.6% in early trading. U.S. stock futures were weaker. There's was more red on screens across Asia. Japan's benchmark Nikkei index closed down 2.2%, while Seoul's KOSPI Composite lost 2.4% and Australia's ASX All Ordinaries ended 1.2% lower. The reaction in currency and bond markets was more subdued. After falling about 1%, the euro stabilized against the U.S. dollar to trade at $1.10. Bonds issued by Spain and Portugal, which have emerged only recently from their own painful bailout programs, took a modest hit. But Germany's 10-year bond, seen as a safe haven for investors, was in demand. Greece believes the vote against more austerity will give it a stronger negotiating position with its European creditors. It's unclear whether Europe or the International Monetary Fund will restart formal negotiations. One potential hurdle was removed when Yanis Varoufakis resigned as Greek finance minister Monday, saying he wanted to help smooth the path to an agreement. "While the players have changed, the facts haven't," CMC Markets analyst Michael Hewson said. "We're not fundamentally further on than we were on Friday." Investors were waiting on the outcome of a key decision from the European Central Bank on whether to keep up support to Greece's cash-strapped banks. The ECB meets later Monday. Hewson said until the ECB moves one way or another, trading in currency and bond markets will remain subdued. 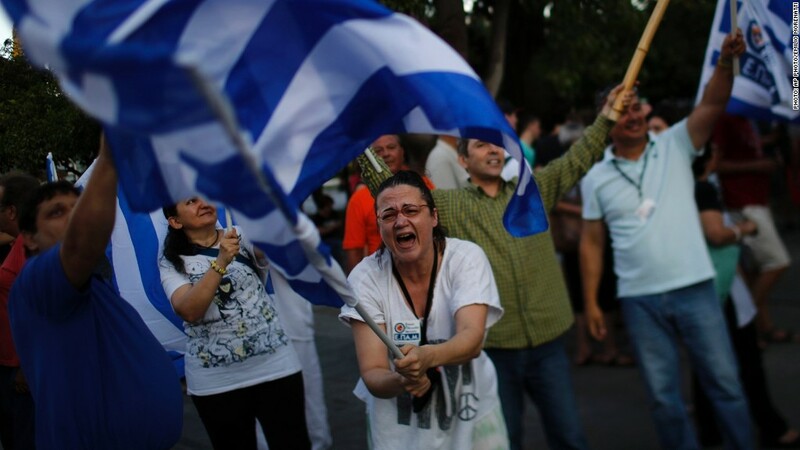 The vote could trigger a series of events that lead to Greece becoming the first country to leave the euro. Here's why: Greece is on the brink of going bust. It urgently needs money to pay pensions and wages, and to reopen its banks -- shut for a week already after talks with its creditors collapsed. If Europe isn't prepared to relax the terms it was offering Greece just last weekend, and there's no indication it will, Greece will have to start printing its own currency soon. On the other hand, if Europe compromises and agrees to write off some of Greece's huge debt, the credibility of the currency will suffer. "Whatever the outcome of the next few days, there is no way that the eurozone or the single currency can come out stronger as a result," said Simon Smith at FxPro. The risk of fallout from Greece's collapse directly hurting other European countries is relatively small. Most of its debt is held by governments who could cope with default. But it will take the eurozone -- the bloc of 19 nations that use the euro -- into uncharted waters. It also sets a bad precedent. Membership in the euro was supposed to be a one-way street. In fact, there's no rule book to manage a member country going bust and crashing out. It's hard to imagine any other country choosing to follow Greece into the economic abyss, but some weaker eurozone economies may pay the price in permanently higher borrowing costs if a 'Grexit' materializes. The uncertainty of the next few months could also weigh on European business confidence at a tricky time. The eurozone economy (except Greece) is recovering nicely, but investors are worried about the impact a slowdown in China will have on exports. Central banks have been preparing for the worst. The ECB unveiled a significant new weapon in its armory last week, when it said it may buy the bonds of a number of companies in vulnerable eurozone countries such as Italy, Portugal and Spain as part of its massive stimulus program.